With December upon us, and the New Year beckoning, so many of us are getting busy with the hustle and bustle of holiday shopping, making lists, and checking them twice. I’d like to take a few minutes from all the festivity planning to share a list of my own I think we can all appreciate—the simple joys I’ve learned from my dogs! As I look back not only over the past year, but all the years spent with my beloved canine companions, both past and present, and I relish in the joy they all have added, and still do add, to my life. From our rescued collies who devotedly followed teen me wherever I went (I still say my mother put them up to it! 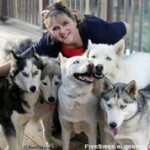 ), to my little found Spitz I brought home on horseback and adopted, to our adopted New York City Police Department retired K9 German Shepherd, my two beautiful mixes adopted from our local SPCA, and, of course, my incredible five Siberian Huskies, fondly known as the FiveSibes — all have taught me some valuable lessons about life itself. No matter what breed or mixed breed of dogs we have in our lives, I feel we are blessed to share a part of life’s journey with them. To enjoy the more simpler things in life: the touch of a breeze, a beam of sunlight stretching across the deck, a butterfly as it flutters by, the feel of raindrops tapping my face, the smell of blooming flowers, the coolness of grass, the sound of fresh snow crunching under foot, and the taste of quietly falling snowflakes! To appreciate the food and treats I’m fortunate to have to eat, and to share that good fortune with others, both human and canine! To realize how wonderful snuggling together can be. Whether together on the couch, cozied up by the fireplace, or huddled together on a sleigh, there’s no better place to be than together! To always respect the inner child and remember to have fun! Go right ahead and run in the yard, splash in mud puddles, catch snowflakes on the tongue, and roll around in grass! To embrace the excitement—at any age—of receiving a new toy! No matter the “toy,” be happy for it! To learn how to naturally de-stress by taking a moment or an hour to stretch out under a sunbeam shining through a window! To know the true the meaning of trust and patience, as only our dogs can teach us! To understand the real definition of loyalty and unconditional love, as demonstrated by our dogs on a daily basis! To learn a new language—“dogese”—and develop a deeper level of communication with our furry best friends! To embrace the chaotic excitement of greeting a family member upon their safe return home every single time they come through the door! To appreciate all types of music, including canine tunes, and the various octaves of a beautiful howl! And, maybe even join in a chorus or two of howling with your dog! To enjoy all the moments – even the small ones – and capture some of them on film to revisit and reminisce over in seasons to come! To totally appreciate K9 kisses for the priceless gems they are! There are just so many things we can learn from our pets. Whatever we do, let's remember how loyal our furry family members are, and use this season of giving to not only show our own dogs (or cats, horses, bunnies, etc.) even more than usual just how much we love and appreciate them, but to also take some time to help those animals who are less fortunate than our own. So what’s on our dogs’ wish list? 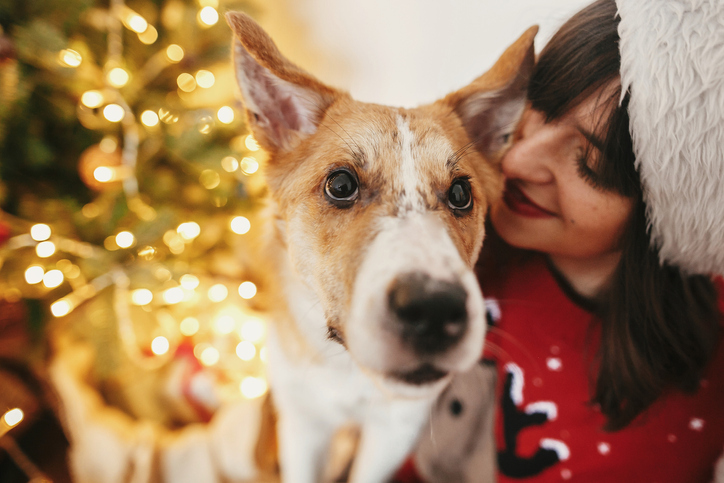 To give the gift of love to a dog that is spending the holidays alone in a shelter, without a family of his or her own, by “adopting” him or her for the holidays, whether it is sharing a few moments of petting or going for a stroll, a monetary donation, or even a gift of food, toys, and/or a soft bed. And in return, we promise, you will experience a gift of true joy. We here at FiveSibes wish you and yours all the happiness and joy this season has to offer!